I hope everyone had a great Thanksgiving and a successful Black Friday! I was able to get about half of my shopping done online the past two days. Thankfully, the boys are going back to school Monday when the boxes begin to arrive so I can start wrapping presents as they come in. 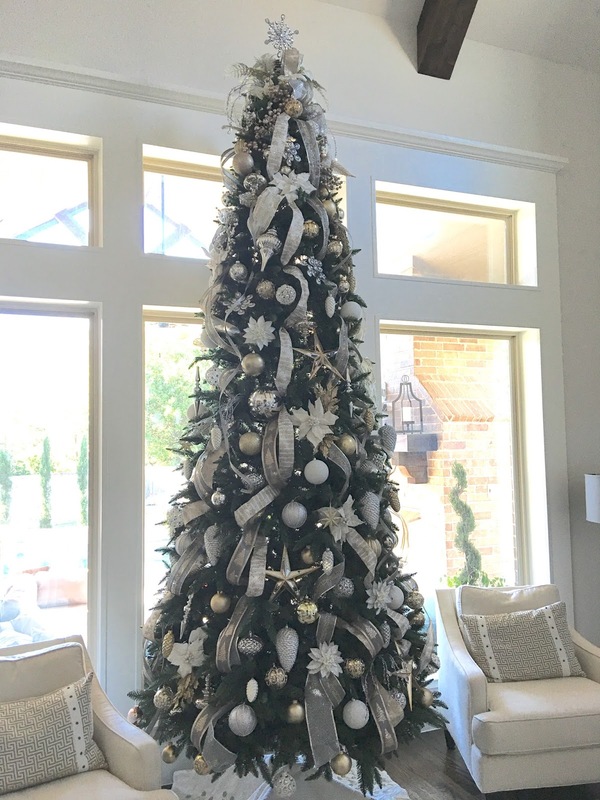 I will be finishing up my Christmas decorating this weekend for a full house tour next week. 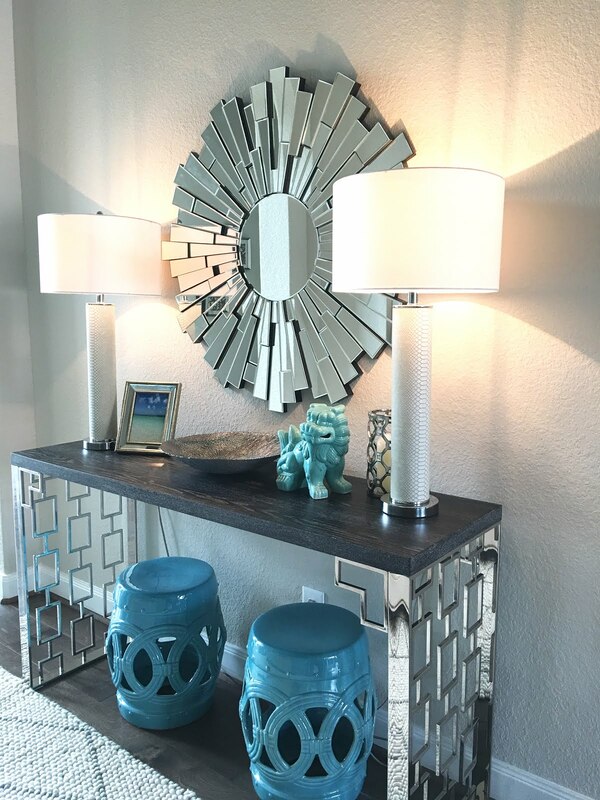 I know many of you are already decorating your homes so I want to share a few tips that will hopefully make your decorating a little easier! My new tree may be 12 feet tall, but it was not at all expensive. I looked for a full and pretty tree online, but the average price was $1500. I just couldn't even imagine spending that much so I went to Wal-Mart and found this pre-lit one for $250. It isn't the fullest tree, but that's completely fixable. I separated the branches to make it fuller and filled the gaps with greenery. I bought several inexpensive garlands for $4 each and cut them up into six, one foot pieces. I used about four garlands for this tree. As you can see below, I just inserted the pieces wherever I could see through the tree. I love the ribbon at a local boutique, but not at $30-60 a roll. It's very easy to get a similar look by layering ribbon. Use a basic, wide ribbon like this mesh and then top it with a thinner decorative ribbon. 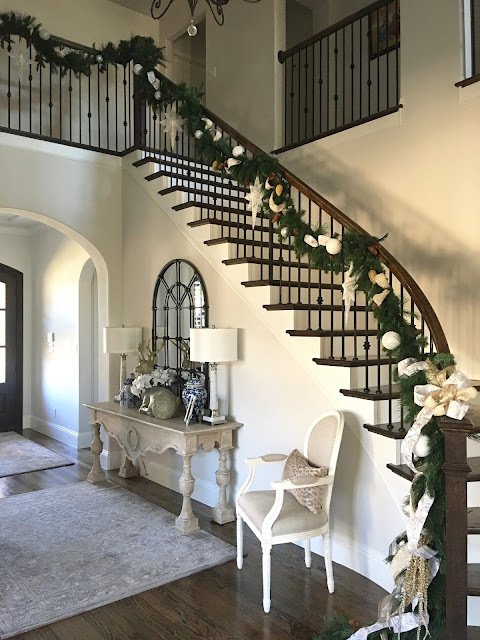 Adding garland to the stairs has always been difficult for me until this year. I used ribbon in the past and it always came loose. There were many times the entire length of garland came crashing down into the entryway as I fought to put it up. I decided to try these garland ties I found at Home Depot. I couldn't believe how well these held the garland in place. It only took about 20 minutes to hang it all up this year. Every craft store carries ribbon all year round. Check that section of the store in addition to the Christmas aisles. 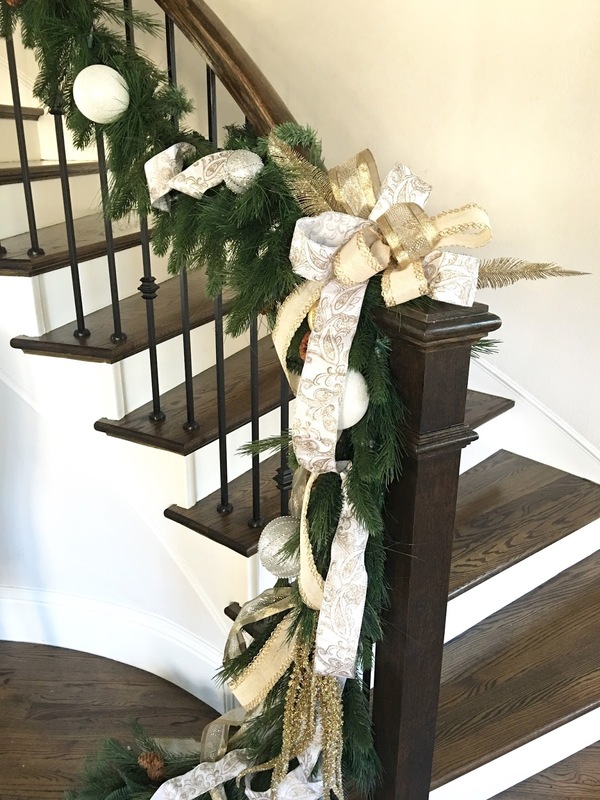 The white paisley and burlap/gold ribbons on the stairs were non-holiday ribbons at Hobby Lobby, but they were still 50% off. I get the most questions about how to decorate a tree with ribbon. There is not just one way. I actually used a different method for my stair garland than my tree. I'll show you both. On the tree, I knew I wanted it to be "ribbon heavy." I start at the top of the tree and work vertically. I secure the ribbon with branches like most people, but I prefer to secure them further inside the tree so there's less "branch pinching" to hide with ornaments. I make half circles with the ribbon that are tight enough so it's not slack, but loose enough to create a loop that sticks off the tree. I also like to use two different ribbons. In some sections they split apart and others they come together with one just peeking out behind the other. Even though I work vertically, I still angle the ribbon for interest. You can see how they are paired together. Some areas they run together and other areas they are separated. If you prefer a tree with less ribbon try cutting it into smaller pieces and only making two to three loops randomly on the tree. This is the method I used for my stair garland. I cut one foot sections of ribbon and just made two loops so it didn't overwhelm the garland. I hope this helps if you are fighting with your ribbon or garland right now. Have a great weekend! I'm so impressed that you have most of your shopping done! The tree and banister look so pretty! Great tutorials! Love the ribbon technique. I may have to try that next year. I emailed this to my daughter. She will love it. thanks for sharing.